In a previous article about content marketing, I recommended that when looking for material to use, your company’s mission statement can act as a frame of reference. But talking about values can be as numbing as talking about your own kids. Many people have kids and are less interested in yours than their own. So how do you talk about corporate values without sounding like a preacher? If we want to communicate around a particular value, the communications and even the way we talk about it must be consistent and coherent. In commercials, for example, we regularly have to deal with this. Imagine a company wants to let the world know that it is creative. So the copy novice writes: “We are creative. It’s part of our DNA. Everything we do, we do to bring you new solutions… And yadda-yadda…”. But if the company is creative, in a way it does not really have to say so. One could simply quote the number of its patents. Is that not evidence enough? Or why not let the message or the medium prove this unquestionably. 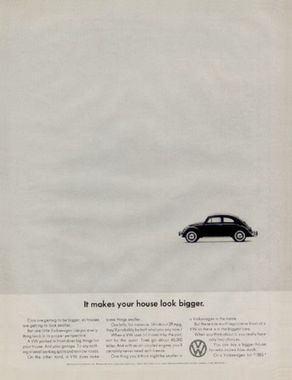 In pioneering ads in the US, VW showed that it was the alternative to cars that were too big, over-decorated and fuel guzzlers. The headlines and visuals did most of the work. I really believe that a company’s values and “mission statement” should serve as a framework for any communication. It’s part of who you are as a company. You don’t have to invent everything from scratch every time you communicate. Sometimes it’s enough to deepen, illustrate and adapt it for the needs of your audience. Mission statements are not read often enough (and on a side-note, read yours now. Is it still valid? Does it not sound too sanctimonious? The clearer the language, the greater the uptake!). One last thing, the more you get into the mode of showing the message rather than telling it, the more credible you become. The “Led by Donkeys” campaign in the UK was powerful because it is so easy to pull people up on what they say when this is in open contradiction to what they are doing. So don’t forget to be consistent and coherent – which brings us back to the corporate values and mission statement. Start from there. drop a note to Michael.